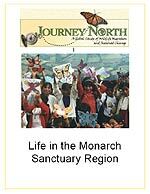 Use some or all of these reading activities as you read each bilingual story about life in the Monarch Sanctuary Region. Note: Each slideshow story also has a link to relevant reading activities and handouts. How is life in the region the same as your life? How is it different than your life? What things does the story make you wonder about? What questions would you ask the student or adults depicted in the story? What does this story say or imply about challenges for a) people living in the region, b) monarchs, c) monarch habitat, or d) conservation efforts? What Story Do Photos Tell? 1) Pull up the Spanish version of the story. Look closely at the first picture. What sentence or caption would you write about the picture? Option: After looking at all the pictures in the story, but not reading the English versions, write one or more paragraphs that you think describe the story or life in the region. Use descriptive words. 2) Click to the English version of the page. How does it compare with your ideas about what was happening? Write or tell a partner about how you would feel if you could spend some time living with the family or in the region. << Back to Bilingual Vignettes, "Life in the Monarch Sanctuary Region"
Places and Regions: The physical and human characteristics of places. Human Systems: The characteristics, distributions, and complexity of Earth's cultural mosaics.